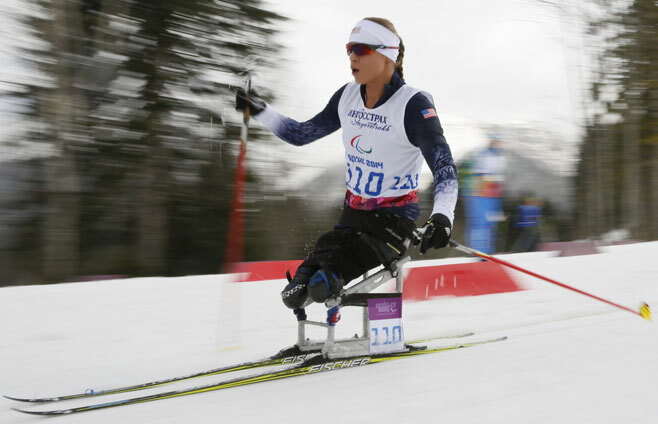 Courtesy (AP Photo) Oksana in action at the 2014 Paralympic Games in Sochi. Oksana was named as one of five female Paralympic athletes for the honor of being named the 2014-15 Female Paralympic Athlete of the Year. During the 2014-15 campaign she won 3 World Championship medals in total, two in Nordic Skiing and one in hand cycling while also claiming the Overall Cross Country World Cup title with 7 Gold medals during the season. Oksana will be at the Team USA Awards traveling from the first Nordic Cross Country World Cup event in Siberia to Moscow to Munich and then on to Philadelphia the day of the show. If you are interested in speaking with Oksana, please drop us an email at Senator@me.com or fill out our contact form. Haley Anderson of the U.S. Swim team won her 2nd FINA World Championship Gold Medal in a row with a time of 58:48.4 in the first event at the aquatics world championships. Haley won the event previously in 2013 in Barcelona, Spain. Next up for Haley will be the 10k open water event that with a Top 10 finish will qualify for her for the 2016 Summer Olympic Games in Rio. USA's Haley Anderson sprinted to victory in the women's 5km to capture the first gold medal of the 16th FINA World Championships. Anderson, the silver medallist in the 10km Olympic Marathon at the 2012 Olympic Games in London and 2014 Pan Pacific Champion was always in the lead pack of the race. Haley is a native of Granite Bay, California. She is a graduate of the University of Southern California where she currently trains as a post-graduate. Haley and her boyfriend (Chase) resides in Manhattan Beach, CA. Post-FINA Worlds, Haley will go on vacation to Israel and Greece and will be back in Southern California August 18-19 before going to Rio de Janeiro for a test event on the Olympic course. If you are looking to speak with Haley, please send a request to AGMSports@aol.com or fill out the request form here on www.agm.us. Paige Selenski of the U.S. Women's Field Hockey team won her 2nd Pan Am Games Gold Medal in a row with a 2-1 victory over rival Argentina on Friday evening at the University of Toronto. With the team's win over Canada in the semi-finals, USA Field Hockey earned their qualification for the Rio 2016 Summer Olympic Games. Paige is a native of Shavertown, PA. She attended the University of Virginia where she earned a degree in English. Paige will be living in the Lancaster, PA area where the US Women's National Team is based at the Spooky Nook training center. The team drove back to their home base in Lancaster on July 25 and If you are looking to speak with Paige, please send a request to AGMSports@aol.com or fill out the request form here on www.agm.us. Team captain Tony Azevedo of the U.S. Men's Water Polo team won his 5th Pan Am Games Gold Medal adding to his 2011, 2007, 2003 and 1999 collection in a 11-9 victory over Brazil at the Atos Pan Am / Para Pan Am Aquatics Centre in Unionville, ON (Markham). With the victory, Team USA now qualifies for the Rio 2016 Summer Olympic Games. Tony is a native of Rio de Janeiro, Brazil where he was born, but grew up and was raised in Long Beach, CA. He attended Stanford University where he earned a degree in International Relations and post-college has played professionally in Europe and now today in Sao Paulo, Brazil. Tony will be living in Southern California training with the US Men's National Team from the Fall until Rio 2016. Currently at the FINA World Championships in Kazan, Russia, If you are looking to speak with Tony, please send a request to AGMSports@aol.com or fill out the request form here on www.agm.us. Melissa Tancredi and Kaylyn Kyle were named to the 2015 FIFA Women's World Cup team in an announcement carried LIVE on all Bell Media (TSN / CTV) platforms in Canada. Tancredi was named to her 3rd Canadian FIFA WWC Team while Kyle was named to her 2nd. Both Tancredi and Kyle were members of the 2012 Summer Olympic Bronze medal winning squad in London, with a victory over France 1-0 in the 3rd place match. The 2015 FIFA Women's World Cup will be hosted in Canada for the first time. Cities include Edmonton, Montreal, Ottawa, Vancouver and Winnipeg. Canada opens up action vs China on June 6 in Edmonton followed up by matches vs New Zealand also in Edmonton and The Netherlands in Montreal in first round games. If you are looking to speak with Melissa or Kaylyn, please send a request to AGMSports@aol.com . Haley Anderson wins the US National Championship in 5k Open Water Swimming and places 2nd in the 10k with races on 24th (10k) and 26th (5k) of April. With her 2nd place finish in the 10k event, Haley qualified for the 2015 FINA World Championship which will serve as the first opportunity to qualify for the Rio 2016 Summer Olympics. She and race winner Becca Mann, earned the 2 spots that have the ability to earn their ticket to Rio should either or both of them finish in the Top 10 in Kazan at FINA Worlds. The United States may only have 2 spots in the 2016 Summer Olympics in the discipline of Olympic Marathon, Open Water Swimming. Haley repeated her performance from the previous year and won her 3rd 5k US National Championship. Haley is now qualified to compete in FINA Worlds in both the 5k and 10k disciplines. At the 2013 FINA World Championship in Barcelona, Spain, she earned her first World Championship in the 5k. If you are looking to speak with Haley, please send a request to AGMSports@aol.com . Through the Special Olympics Unified Relay Olympian Challenge, Olympic medalists have committed to running, biking or walking a segment in the upcoming Unified Relay Across America. They will help to carry the torch and deliver the Flame of Hope, the official torch for the Special Olympics World Games, to Los Angeles, while challenging their fellow Olympians and peers across the world to participate. Washington, D.C. - In anticipation of the upcoming Special Olympics World Summer Games to be held in Los Angeles this summer, 20 Olympic medalists across the world have come together to show their support of Special Olympics by participating in the first-ever Special Olympics Unified Relay Across America presented by Bank of America. Leading the challenge is Olympic swimmer Donna de Varona, along with American gymnast Bart Conner, Romanian gymnast Nadia Comaneci, Russian-American artistic gymnast Nastia Liukin, American figure skaters Scott Hamilton and Michelle Kwan, American snowboarder Hannah Teter, American short track speed skater Apolo Ohno, American speed skater Casey FitzRandolph, American professional basketball players Sam Perkins and Ruth Riley, American swimmers John Naber and Jessica Hardy, American soccer player Kristine Lilly, American freestyle skier Ashley Caldwell, Swiss swimmer Dominik Meichtry, Paralympic athlete April Holmes, American bobsledder Steven Holcomb and American ice hockey players Julie Chu and Jocelyne Lamoureux. Through the Special Olympics Unified Relay Olympian Challenge, they have committed to running, biking or walking a segment in the upcoming Unified Relay Across America helping to carry the torch and deliver the Flame of Hope, the official torch for the Special Olympics World Games, to Los Angeles, and are challenging their fellow Olympians and peers across the world to participate. "Please join me in supporting Special Olympics and the World Games by running in our Torch Relay," said de Varona. "This is a once-in-a-lifetime opportunity to take part and be a part of a very special gathering!" For 46 days, from May 26 to July 10, in the first known torch relay to cross all 50 states, more than 20,000 participants will run, walk or bike over 10,000 segments of the relay. The Unified Relay is a team and individual fundraising event. Three simultaneous relay routes will cover almost 21,000 miles of the US, starting their individual journeys in Augusta, Maine, Miami, Florida and Washington, DC and unifying in Los Angeles. Along each route, welcoming ceremonies and community celebrations will take place nightly with musical performances, celebrity guests and Unified Sports Experiences, where people with and without intellectual disabilities play on the same team. When the three relays arrive in Los Angeles, the Law Enforcement Torch Run Final Leg Team, comprised of law enforcement officers representing 36 countries, along with 10 Special Olympics athletes, will accept the torches and continue the Flame of Hope's journey to communities throughout California, including Host Towns where Special Olympics World Games delegations from more than 170 countries will participate in pre-Games cultural exchanges. Anyone can have the opportunity to run with the Flame of Hope by signing up as an individual torchbearer or as a team of torchbearers for a half-mile walk or run segment or a five-mile bike segment in an area of interest across the United States. Funds raised from the Unified Relay will go to Special Olympics to provide sports training, competition opportunities and additional programming that empowers people with intellectual disabilities to become accepted and valued members of their communities, which leads to a more respectful and inclusive society for all. Participants can find out more information and sign up for the Unified Relay Across America presented by Bank of America at www.unifiedrelay.org. From July 25 - August 2 Special Olympics will hold its flagship event, the Special Olympics World Games in Los Angeles, CA, demonstrating sports excellence, which promotes equality, respect and inclusion for people with intellectual disabilities around the world. Transcending the boundaries of geography, nationality, political philosophy, gender, age, culture and religion, the world will come together for the largest sporting and humanitarian event on the planet to see 7,000 athletes from 170 countries compete in 25 sports. Special Olympics is a global movement that unleashes the human spirit through the transformative power and joy of sports, every day around the world. We empower people with intellectual disabilities to become accepted and valued members of their communities, which leads to a more respectful and inclusive society for all. Using sports as the catalyst and programming around health and education, Special Olympics is fighting inactivity, injustice and intolerance. Founded in 1968 by Eunice Kennedy Shriver, the Special Olympics movement has grown to more than 4.4 million athletes in 170 countries. With the support of more than 1.3 million coaches and volunteers, Special Olympics delivers 32 Olympic-type sports and more than 81,000 games and competitions throughout the year. Visit Special Olympics at www.specialolympics.org. Engage with us on: Twitter @specialolympics; fb.com/specialolympics; youtube.com/specialolympicshq;instagram.com/specialolympics and specialolympicsblog.wordpress.com. Meghan Duggan, Team Captain of the 2015 U.S. Women's Ice Hockey Team, captures her 5th World Title tying her with 2014 Winter Olympic teammates, Julie Chu and Hilary Knight as the most honored World Champion from the United States all-time. The U.S. defeated Canada 7-5 in the Gold Medal match at the 2015 IIHF Women's World Championship. After sitting out the semi-final match versus Russia and being admitted to the hospital, Meghan returned to action in the Championship game. During the 2015 IIHF Women's Worlds, she played in her 100th game for the United States. If you are looking to speak with Meghan, please send a request to AGMSports@aol.com .